As a company, we’re grateful for many things—our customers, our success, and especially the opportunity to work in an industry that makes a positive impact on our world. We also believe that with business success comes an added responsibility of being a good corporate citizen. To this end, we try to do our part to protect the environment and give back to the community in several ways like performing service projects, adopting environmentally friendly policies, and donating a significant portion of our profits to worthy causes. Below are just a few of our environmental practices and the causes and institutions we’ve supported in the past. We love doing business this way and hope to do our part for many years to come. In an effort to reduce environmental waste, Apogee Instruments began providing digital product manuals instead of printing manuals to be sent out with each product. These manuals can be easily accessed, saved, or printed at any time from apogeeinstruments.com/manuals. Apogee Instruments is committed to reducing the negative impact our work place has on the environment. In 2007, the company moved from Dr. Bruce Bugbee's garage into a new state-of-the-art facility (pictured above) that was designed to work with the environment to reduce our carbon footprint. The building features passive solar windows and an open internal architecture that allows natural light to reach all work stations. The 22° overhang above the windows provide shade and reduce heat in the summer, while providing more light and heat during the winter. To further reduce energy costs, the building uses radiant floor heating, and is "super-insulated". The roof has an R-value of 80, the walls are R-40, and the low-E thermopane glass has an R of 3.4. The building is monitored and controlled with a Campbell Scientific CR3000 datalogger coupled to 64 multiplexer input channels and 32 output control channels. Internal and external temperature, humidity, CO2, O2, air velocity, and solar radiation are graphed on displays on the wall. By 2016, Apogee had outgrown its 2007 facility, which led to an expansion that tripled the size of headquarters (pictured above). The expansion was built with the same energy saving features from the original building including open architecture, passive solar windows, 22° overhangs, radiant floor heat, and "super-insulation". As part of the building expansion in 2016, Apogee Instruments added 17 PV panels to the front of the building. The window below shows the energy produced by the panels at a given time, as well as a complete history of the energy they have produced. Additionally, the left column displays the energy produced in relation to the energy needed to run a fridge, charge a phone, light a light bulb, and other common energy uses. Apogee Instruments and its employees believe in giving back to the community we work in. As part of our commitment to giving back to our community, Apogee actively participates in volunteer work and gives charitable contributions. Further information on our contributions to our community can be seen below. 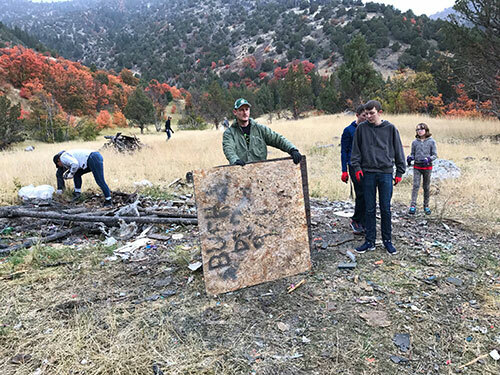 On September 30, 2017, Apogee employees and their families cleaned up several tons of garbage from a wildlife habitat area in Logan Canyon that had become an unauthorized dump and shooting range. The project was coordinated through the Forest Service as part of National Public Lands Day, which is the last Saturday of September each year. Although it poured rain most of the day, everyone worked hard to clean up the area. We live in such a beautiful place and it felt great to help keep it that way!